Promutuel Assurance’s Guidewire Testing Cuts Response Times in Half with NeoLoad! With revenues of $775 million, Promutuel Insurance is ranked 4th among damage insurers in Québec. Promutuel Insurance alone has over 160 years of history dedicated to protecting the local population’s assets, which gives it unparalleled expertise in its field. Promutuel Insurance continues to have strong operations and is well-established in all regions of Québec through its network of 17 mutual insurance associations, which are recognized for their experience in insurance, economic strength, and social commitment. When the company needs to evaluate “system” success, it recognizes the agent/customer relationship’s critical impact on its bottom line, and thus lists application performance amongst its top KPIs. Assuring the availability, speed, and robustness is a primary objective for an application that can be the impetus behind associate/customer attrition when not performing optimally. This is why load testing using NeoLoad has been well-established habit within the IT department for mission-critical applications for several years. As part of the company-wide migration to Guidewire technology, Promutuel Assurance recently incorporated NeoLoad into the process. Referenced daily by over 400 agents, this policy management system is used for commercial property and casualty insurance, a highly-competitive sector offering extremely high-growth/ profitability as compared to other markets. Guidewire is a framework built on the use of Single-Page Applications (SPAs). SPAs are web apps that load a single HTML page and dynamically update that page based on user interaction. This means that the typical behaviors of the browser DOM are being manipulated. Because all actions are carried out at the browser level, SPAs add an entirely new dimension to performance testing tools that simulate user behavior at the HTTP layer – as browser-generated traffic rather than at the browser DOM level. With NeoLoad, Promutuel Assurance was able to leverage its out-of-the-box integration with Selenium (via Cucumber), their preferred functional testing solution. They quickly correlated performance results directly to browser-specific data. Also, as NeoLoad enabled seamless coordination between functional testing with performance testing, Promutuel Assurance could now produce realistic response times directly from the browser. Lastly, using its UserPath Update utility, they were able to re-use NeoLoad assets for all builds – removing the concern for maintenance issues and increasing productivity of each test cycle. Response Time Cut in Half While Revenue Sees 30% Lift! 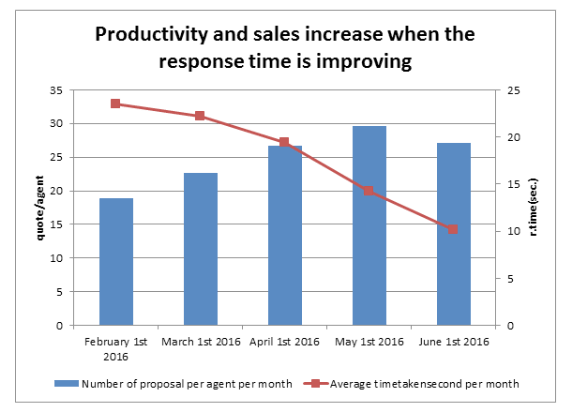 • Given that an agent can create up to three to four quotes (based on the customer-first approach to providing options), faster sales “readiness” is improving Promutuel Assurance’s bottom line and customer satisfaction.